Originally planned as a two part epic, Peter Jackson's adaptation of The Hobbit has since evolved into a trilogy in the style of his Lord of the Rings films - only this time his source material is a 300 page book over three 400 page novels. As a result, the reception has been generally mixed, and disappointing feedback for last year's first installment has left many uninterested for the future of the series. With the promise of more action and the much desired appearance of the dragon Smaug, surely this sequel can redeem all the flaws? In some cases yes, in many others no. Continuing their quest to reclaim the Lonely Mountain from the greedy dragon Smaug (Bennedict Cumberbatch), Bilbo Baggins (Martin Freeman), the wizard Gandalf (Ian McKellen) and the company of dwarves lead by Thorin Oakenshield (Richard Armitage) find themselves facing further perils as they brave the dangers of the Mirkwood forest and conflict with the Wood Elves, as well the pursuing Orcs and their mysterious leader. 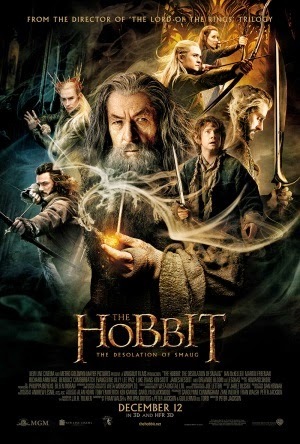 As the company press on and eventually make it to their destination, the evil inside begins to awaken, and Bilbo is faced with his dangerous task that lead him to join the epic quest in the first place. Pacing is the weakest element of Jackson's return to Middle-earth; content has been extracted not only from the source material but a number of appendices Tolkein penned at the end of his Lord of the Rings books, resulting in an overdose of plot threads and unnecessary characters that never appeared in the original book. What then happens is the loss of the main idea of the story in all the mishmash of subplots. While the first film definitely suffered from this, I'd probably say that this sequel has it worse off as it features even more characters and sluggish scenes that never seem to benefit the overall plot. You wanted to see the dragon in this film, right? Be prepared to wait nearly two hours for him to show up. I am not kidding. While this isn't a problem on its own, it is a problem when you realize how dragged out many of the preceding scenes feel and how painful it is to sit through some really boring moments that try to exude tension but end up making you impatient. The final 40 minutes of the film are absolutely superb, and there are some brilliant action scenes and a good sense of humour flowing across the near 3 hour story. However, this isn't enough to save the film from its many moments that do their best to put you to sleep. 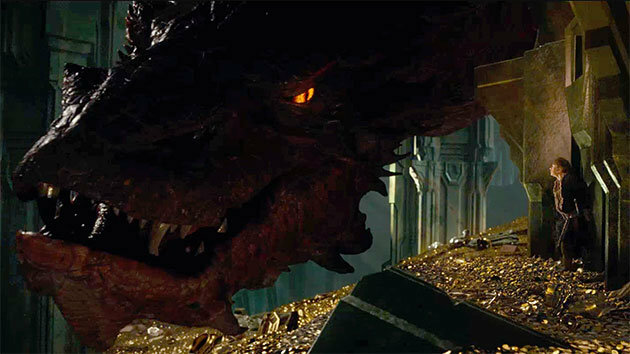 There's really no need for me to say that the special effects are brilliant, but I have to give specific praise to the creation of Smaug who was not only beautifully voiced by Cumberbatch but also portrayed by him via motion capture. As a result, he's animated wonderfully as a gargantuan beast, but there is a perfect degree of emotion within his facial expressions; giving him the intelligence and depth the character requires. It's a shame I cannot extend this praise to the overall film which, enjoyable as it is at times, feels very dragged out like its predecessor. I probably enjoyed this one less than the first, which is a bold statement when you see how flawed they both are.